This appetizer is certain to please even the most finicky reveler at your party. Put the white beans, cashews, water, lemon juice, garlic, salt, and cayenne pepper in a high performance blending appliance and process until smooth and creamy. Do not over process. 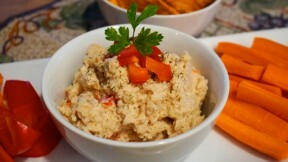 Serve with carrot sticks, celery sticks, zucchini sticks, tortilla chips or whole-grain crackers.